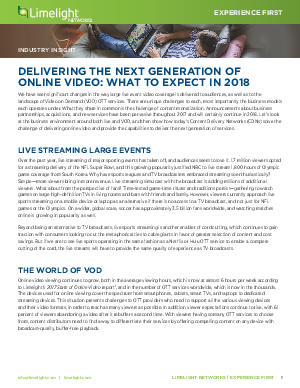 There are a number of factors contributing to the growing popularity of streaming live events or offering content on demand, from anywhere, any time, on any device. Live streaming major sporting events such as the Superbowl or the Olympics is now a viable alternative to broadcast TV. And as Limelight’s 2017 State of Online Video report reveals, the average number of online viewing hours is almost six per week. However, as viewer expectations continue to rise, keeping audiences happy and engaged isn’t easy. In this white paper we discuss current trends and what to expect in 2018. We examine the role Content Delivery Networks (CDN) can play in optimizing the delivery of online video content at global scale, and the technologies available to ensure the lowest latency delivery possible.